A high quality and unique alternative for conventional cast iron and stainless steel pipes, the ProLine™ series column pipes feature a range of high-tensile, high-impact uPVC pipes and accessories for submersible pump installations. The PumpWave™ series is a range of electronic pump controllers ideally suited for domestic water supply in and around the home. 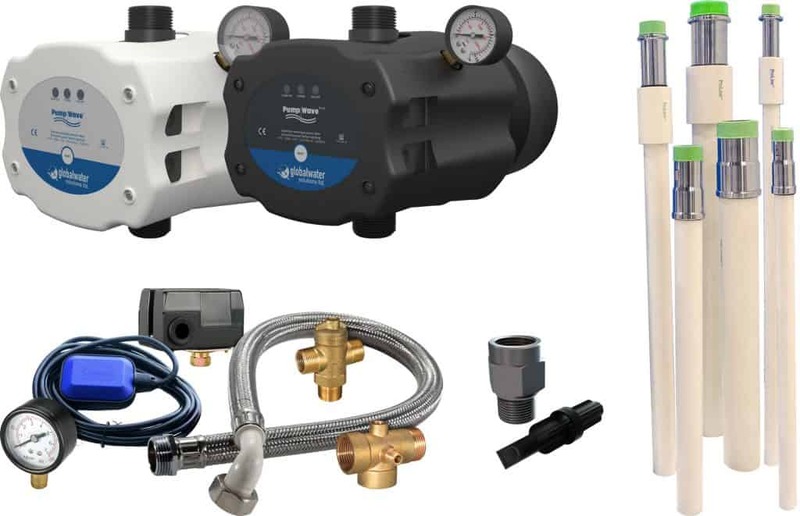 We offer a wide range of accessories to complement your Global Water Solutions pressure vessels or water treatment products, including three and five-way connectors, flexible hoses, smart pressure valves, pressure switches, pressure gauges, universal brackets and pump stands. The FlowThru™ inline adaptor; compatible with all GWS inline tanks having a 1″ connection is uniquely designed to ensure maximum circulation within the tank while assuring low pressure drop in the main pipe. A great solution for combating waterborne bacteria such as legionella.